The suspect is thought to be a 26-year-old of Moroccan origin who had lived in Spain, said sources close to the investigation. French investigators were today interrogating a man who was overpowered by three young Americans after he opened fire with a Kalashnikov on a train between Amsterdam and Paris. 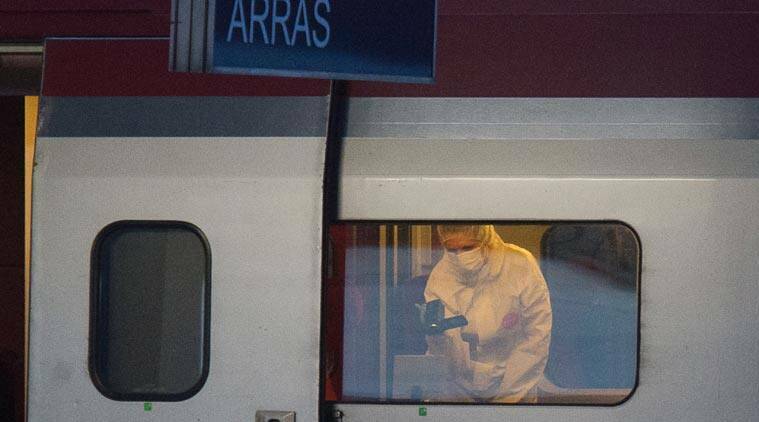 Armed with a Kalashnikov assault rifle, an automatic pistol, nine cartridge clips and a box-cutter, the man opened fire on board the TGV train just after it crossed from Belgium into France yesterday. But the attack was quickly stopped when a group of young Americans on holiday — two of them off-duty soldiers — charged the gunman and overpowered him. “I looked back and saw a guy enter with a Kalashnikov. My friends and I got down and then I said ‘Let’s get him’,” Alek Skarlatos, a 22-year-old member of the National Guard in Oregon, told reporters. Spencer Stone, who is reportedly in the US Air Force, was the first to reach the gunman who slashed him in the neck and hand with a box-cutter. “At that point I showed up and grabbed the gun from him and basically started beating him in the head until he fell unconscious,” said Skarlatos, who recently returned from service in Afghanistan. “As soon as we saw him, we all ran back there. It all happened really fast,” said Sadler.